If you are a Doctor Who fan in need of a notebook then this spiral bound notebook with the 11th Doctor on it could be just what you need. On the cover of this notebook you can see a drawing of the 11th Doctor with his Sonic Screwdriver in his hand. 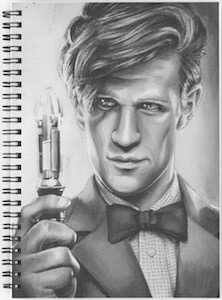 It’s a great portrait of Matt Smith and I am sure that Doctor Who fans will love to own one of these. The Doctor Who notebook is available a lined or graph version and has 120 pages. The notebook is 8.2 inch tall and 5.2 inch wide and would be great for school, work and just as a notebook around the house. Is the 11th Doctor you favorite Doctor Who? If so then this is the t-shirt to get as it shows Matt Smith as the Doctor and on him you can see the galaxy he traveled in. Also on the Doctor it says “My Doctor”. 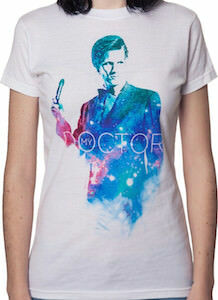 This girls Doctor Who t-shirt is just perfect if you are looking for a fun shirt with the 11th Doctor on it. You can get this Doctor Who t-shirt in women’s sizes Small – XL and it is slim fitting and made from 100% preshrunk cotton. 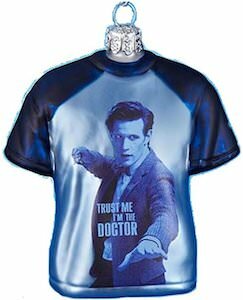 I really like the whole look of this shirt with the light color of the shirt and the blue’s and greens of the Doctor. Why not have a closer look at this Doctor Who My Doctor Women’s T-Shirt. The 11th Doctor is not longer with us but this t-shirt will always bring back the memories he left behind. 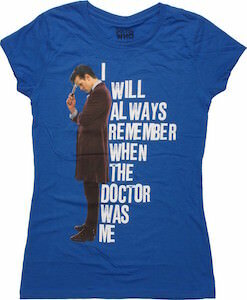 On this blue women’s t-shirt you can see Matt Smith standing dressed as the Doctor pointing the Sonic Screwdriver at his head and at his back there you find the words “I will Always Remember When The Doctor Was Me” just like he said before he regenerated to become the 12th Doctor. This Doctor Who t-shirt is made from 100% cotton and has a slight distressed look. And you can get this last goodbye t-shirt in women’s junior sizes Small – 2XL. Was the eleventh Doctor your favorite? If so then this is what you need to be reminded of him. This is the Doctor Who The Complete Matt Smith Years Blu-Ray Set and that means that it has all the episodes Matt Smith was in and extra’s and all the specials and yes even “The Day Of The Doctor” 50th anniversary special is in this set. 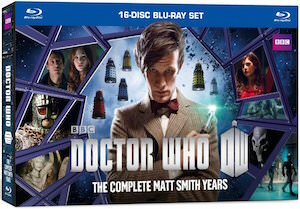 In this set you will find 16 blu-ray disc’s in a book style form that will give your so many occasions to look back at Matt as the 11th Doctor and smile. And not only will you find Matt Smith as the Doctor in this set but Rory, Amy and Clara are all there. Any Doctor Who fan would love to own this Doctor Who The Complete Matt Smith Years Blu-Ray Set. Is the 11th Doctor your favorite and you are looking for a watch? How about this barrel style watch that shows a picture of Matt Smith as the 11th Doctor? The watch is great for women and men and will be a reminder of how great the 11th Doctor Who was. And this Doctor Who wrist watch has a nice leather band so that your watch will look stunning on your wrist and this probably is gone be the watch you will love for a long time. Why go for a boring watch when you can have one that shows the Doctor? Come shop for your new time piece and let it be this Doctor Who 11th Doctor Matt Smith Watch. Doctor 11 maybe gone but he still lives on in most Whovian’s memories. And luckily for us there now is a new Christmas tree ornament that is all about Matt Smith as the Doctor. This Doctor Who ornament is made from glass and looks like a t-shirt with on the shirt a photo of the 11th Doctor and the text “Trust ME I’m the Doctor”. At 3 1/2 inch tall this ornament is just the perfect size to fit in your Christmas tree this holiday season. Balls are fun but an tree ornament that is shaped like a t-shirt that is what you want so get ready to get your own Doctor Who T-Shirt Christmas Tree Ornament. Of course we still like Doctor number 11. And this hobo style bag is just about him and the Tardis. This Doctor Who handbag shows a picture with the Tardis in the background and a closeup of Matt Smith as the Doctor on the right. It’s a great bag for everyday use. It has a snap button for easy closing and access to all your stuff. And because the Tardis is also on the bag it maybe even bigger on the inside. Why have a good old plain colored bag when you can have one with Doctor Who on it. Lets switch bags to this Doctor Who 11th Doctor Hobo Bag. There we have the 11th Doctor played by Matt Smith. And this time he is a figurine and just as real looking as the real Doctor Who. This figurine is based on the Doctor Who episode “The Pandorica Opens” and could have just stepped out of you TV. 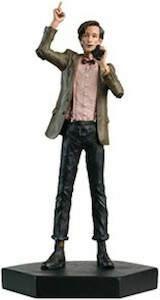 At 4 inch tall this figure of the 11th Doctor is just the perfect size for on your desk, bookshelf or display case. This time the Doctor is made from metallic resin so that it looks amazing and so that it will last many more Doctors. With the 11th Doctor gone we would like to keep thinking about this amazing Doctor Who. And that is why there now is this case for the iPhone 5 and iPhone 5s. The hard case keeps all ports and buttons of your iPhone ready for use and in the mean time it just gives it the perfect Doctor Who look. You can see a big picture of Matt Smith as the Doctor holding his Sonic Screwdriver in his hand. And behind him you can see a galaxy with the Doctor Who logo on top. 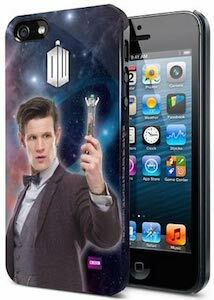 Why not give you phone the Doctor Who treatment it deserves and in the same protecting it from harm. Now is a great time to shop for your Doctor Who 11th Doctor iPhone 5s Case.